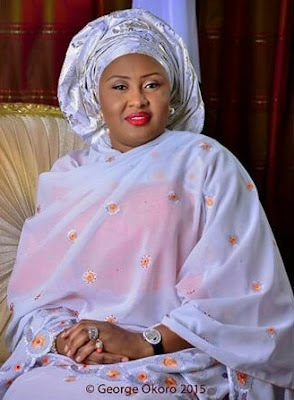 I am not the first Lady says the wife of the President of the Federal Republic of Nigeria Hajia Aisha Muhammadu Buhari. I am the wife of the President and will be addressed as such going forward. With her large smile that easily lights up a room, Mrs Buhari's sense of direction is established. Her jovial nature belies a strong personality who says what she thinks. Speaking at the Appreciation Dinner held last night ,June 13th at the state house , mrs Buhari shared some of the challenges experienced on the campaign trail, ensuring that she diffused a potential life threatening situation with light laughter which shows her sense of balanced perspective on the trials that come with being in the public glare. With an agenda ,giving focus to women issues, the wife of the president wants to see more women in the legislature even from the local government level. While observing the decline of women in the legislative , a situation she hopes to help reverse; she believes empowerment from the ward level will better affect the ordinary woman on the street which was a point she highlighted in an interview with a local news station during the election campaigning.